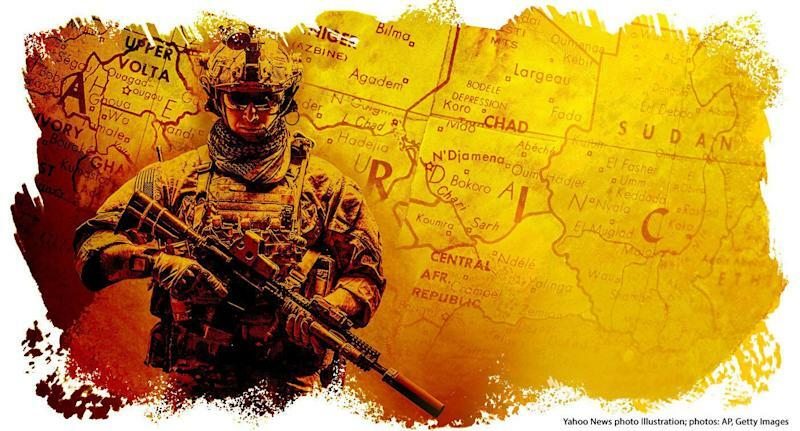 Many Americans first became aware of U.S. military operations in Africa in October 2017, after the Islamic State ambushed American troops near Tongo Tongo, Niger, killing four U.S. soldiers and wounding two others. Juniper Shield and Obsidian Nomad II were not isolated efforts but part of a panoply of named military operations and activities U.S. forces have been conducting from dozens of bases across the northern tier of Africa. Many of these operations are taking place in countries that the U.S. government does not recognize as combat zones, but in which U.S. troops are nonetheless fighting and, in several cases, taking casualties. Between 2013 and 2017, U.S. special operations forces saw combat in at least 13 African countries, according to retired Army Brig. Gen. Don Bolduc, who served at U.S. Africa Command from 2013 to 2015 and then headed Special Operations Command Africa until 2017. Those countries, according to Bolduc, are Burkina Faso, Cameroon, Central African Republic, Chad, Democratic Republic of Congo, Kenya, Libya, Mali, Mauritania, Niger, Somalia, South Sudan and Tunisia. He added that U.S. troops have been killed or wounded in action in at least six of them: Kenya, Libya, Niger, Somalia, South Sudan and Tunisia. Yahoo News has put together a list of three dozen such operations across the continent. 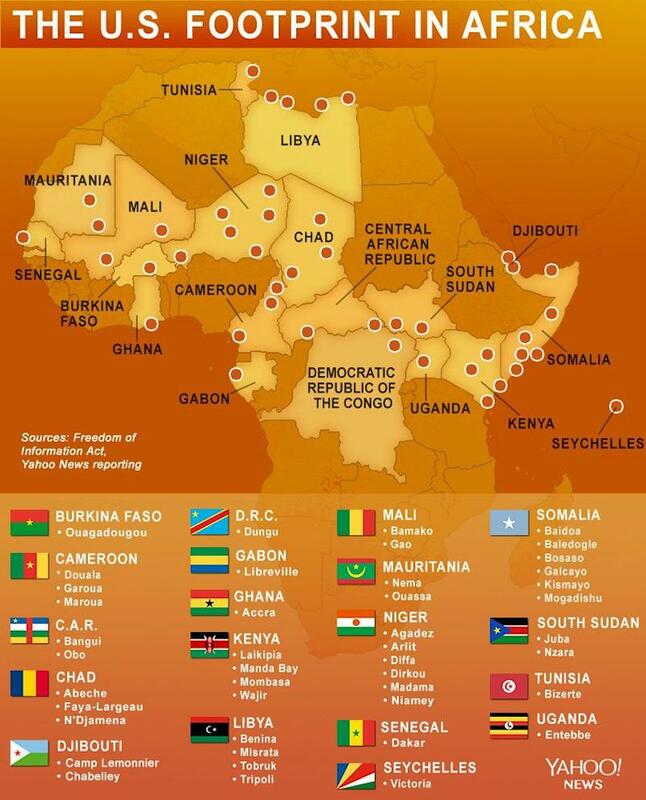 Using documents obtained via the Freedom of Information Act, interviews, published reports and a Defense Department list of named U.S. military operations that leaked online, Yahoo News put together the following list of 36 operations and activities that are (or were until recently) ongoing in Africa. Where possible, Yahoo News has also listed the bases that support these operations, relying mostly on information sheets about those locations obtained via the Freedom of Information Act. Yahoo News does not claim that this list is comprehensive. ARMADA SWEEP: A U.S. Navy electronic surveillance effort conducted from ships off the coast of East Africa, Armada Sweep supports the U.S. drone war in the region. ECHO CASEMATE: This operation covers a series of activities in the Central African Republic. It began in 2013 as a support mission for French and African forces deployed to the troubled Central African Republic for peacekeeping purposes and continued as an advise-and-assist mission to those African peacekeeping forces. However, U.S. forces neither accompanied their partners in the field nor formally trained them. The operation also covered the introduction of contractors and Marines to secure the U.S. Embassy in Bangui and the deployment of a small U.S. special operations contingent to assist the U.S. ambassador in missions to counter the Lord’s Resistance Army. In the first days of the operation, the U.S. military airlifted hundreds of Burundian troops, tons of equipment and more than a dozen military vehicles into the Central African Republic, according to Africom. The U.S. military continued transporting French forces in and out of the Central African Republic, and the mission was still underway in early 2018. EXILE HUNTER: One of a family of similarly named counterterrorism efforts that U.S. special operations forces have conducted in East Africa. Exile Hunter was a 127e program in which elite U.S. troops trained and equipped an Ethiopian force for counterterrorism missions in Somalia. Bolduc says he shut it down in 2016 because the Ethiopian government was uncomfortable about the force not falling under its command. However, a February 2018 Defense Department list of named operations suggests it had been resurrected. JUNCTION RAIN: A maritime security effort in the Gulf of Guinea involving African and U.S. Coast Guard boarding teams operating from U.S. Navy ships or those of African forces. In 2016, the hybrid teams conducted 32 boardings, resulting in $1.2 million in fines levied for more than 50 maritime violations, as well as the recovery of a diesel fuel tanker that had been seized by pirates. Last year, operations with the Senegalese and Cabo Verdean navies resulted in at least 40 boardings — mostly of fishing vessels — and $75,000 in fines handed down for two fishing violations. JUNIPER NIMBUS: Juniper Nimbus is a long-running operation aimed at supporting the Nigerian military campaign against Boko Haram. OAKEN SONNET I-III: A series of three contingency operations in South Sudan. Oaken Sonnet I was the difficult 2013 rescue of U.S. personnel from that country at the beginning of its civil war. Oaken Sonnet II took place in 2014 and Oaken Sonnet III in 2016. OAKEN STEEL: The reinforcement of the U.S. Embassy in Juba, South Sudan, to protect State Department personnel during a conflict between rival factions in that country’s civil war, Operation Oaken Steel, which ran from July 12, 2016, to Jan. 26, 2017, saw U.S. forces deploy to Uganda to provide for rapid crisis response during the unrest. OBJECTIVE VOICE: In 2010, the first head of Africa Command, Army Gen. William “Kip” Ward, told the Senate Armed Services Committee that Operation Objective Voice was an “information operations effort to counter violent extremism by leveraging media capabilities in ways that encourage the public to repudiate extremist ideologies.” Coordinated with other government agencies, this propaganda effort included “youth peace games” in Mali, a film project in northern Nigeria, and, according to his successor, Army Gen. Carter Ham, a “variety of messaging platforms, such as the African Web Initiative, to challenge the views of terrorist groups.” Objective Voice continues today. OBLIQUE PILLAR: A program to provide private contractor helicopter support to Navy SEAL-advised units of the Somali National Army fighting al-Shabab in Somalia. The operation was in existence as of February 2018. OBSERVANT COMPASS: An operation to capture or kill Joseph Kony and eradicate his Lord’s Resistance Army, a militia that has committed atrocities since the 1980s. In 2017, with around $780 million spent on the operation, and Kony still in the field, the United States wound down Observant Compass and shifted its forces elsewhere. But the operation didn’t completely disband, according to the Defense Department. “U.S. military forces supporting Operation Observant Compass transitioned to broader scope security and stability activities that continue the success of our African partners,” Pentagon spokesperson Cmdr. Candice Tresch told Yahoo News. OBSIDIAN LOTUS: A 127e activity concentrated on Libya, in which U.S. commandos trained and equipped Libyan special operations forces battalions. One of those units ended up under the control of renegade warlord Gen. Khalifa Haftar, according to Bolduc. OBSIDIAN MOSAIC: A 127e counterterrorism effort focused on Mali. OBSIDIAN NOMAD I and II: Two 127e counterterrorism programs in Niger: Obsidian Nomad I in Diffa and Obsidian Nomad II in Arlit. The operational name emerged in the wake of the October 2017 ambush in Niger that killed four U.S. soldiers. OCTAVE SHIELD: An Africa Command psychological operation focused on Somalia, carried out under the aegis of Combined Joint Task Force-Horn of Africa, based at Camp Lemonnier in Djibouti. ODYSSEY RESOLVE: Another component of the 2016 special operations campaign of air strikes against the Islamic State in the Libyan city of Sirte, Operation Odyssey Resolve consists of intelligence, surveillance and reconnaissance flights. It was ongoing as of February 2018. PALADIN HUNTER: A 127e counterterrorism program in the semi-autonomous Puntland region of Somalia. ULTIMATE HUNTER: A 127e counterterrorism program using a U.S.-trained, equipped and directed Ugandan force in Somalia. Note: *Information on which operations the following bases support was partially redacted: Douala, Garoua and Maroua (all Cameroon); N’Djamena, Chad; Bangui, Central African Republic; Diffa, Dirkou, Madama and Niamey (all Niger). The list of operations supported by Tobruk and Tripoli (both Libya) was fully redacted. Other data were likely withheld completely.